DecNef, or Decoded Neurofeedback, is a process by which knowledge and skills might be "induced" in the brain. Scientists at Boston University and ATR Computational Neuroscience Laboratories in Kyoto, Japan are using fMRI (functional magnetic resonance imaging) equipment to send signals that alter brain activity. No medication is needed and the subject doesn’t even have to be awake, he or she simply has their brain activity changed to a ‘target’ pattern, which could be anything from that of a star footballer to a master chess player. The researchers knew their technique had worked because the FMRI volunteers all underwent visual skill tests and had their results compared with those of people not given the treatment - and the former had far better scores. Science fiction fans recall many instances in which skills and knowledge are directly implanted in the brain, thanks to creative sf writers. In The Matrix, Neo needs to come up to speed in martial arts quickly; see how long it takes in the following video. I remember this example from Star Trek, broadcast in 1968. In Spock's Brain, space aliens take the brain of Mr. Spock to run their civilization. 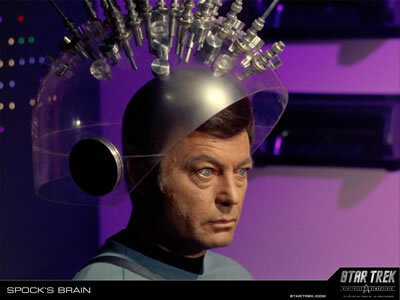 When his brain is finally located, McCoy is dismayed by the impossibility of the task of reconnecting Spock's brain. However, thanks to alien teaching machines, he learns centuries of medical knowledge and techniques in seconds. Via The Daily Mail; thanks to Moira for uploading this tip and reference.